I was really saddened this weekend to hear that Don Herbert passed away. For those not as geeky as me, that's Mr. Wizard. I used to watch Mr. Wizard's World on Nickelodeon as a child and he seemed old then! Don Herbert taught science to so many people and got so many kids excited about science it boggles the mind. I remember so many things I learned from that show. He taught concepts in such fun ways. Here are a few highlights I remember off the top of my head. I remember he taught how flour mills explode by putting a birthday candle in a paint can, feeding a tube into the side of the can, putting a small pile of flour just inside the hole, lighting the candle and then putting on the lid. When he blew into the tube it filled the air in the can with tiny particles of flour which caused the top of the can to explosively blow off when the candle lit them on fire. I remember him demonstrating air pressure by filling a large can with hot air and then submerging it in cold water. The change in air pressure as the air inside cooled crushed the can. I remember him cutting a banana without peeling it. I remember him showing how to play a record with a foam cup and a straight pin. I remember him drawing the space shuttle on a computer with very early computer graphics. I remember him teaching about fiber optics by putting a flashlight into a black paint can and punching a hole in the side. The water arched out and acted like fiber optics bending the light from the flashlight onto the spot where the water hit. 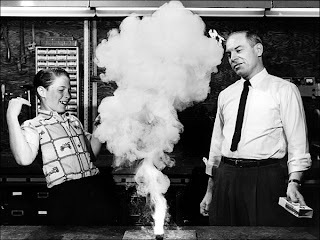 I remember him showing air flow from cold to warm with some dry ice, regular ice, a lamp and an aquarium. I remember him calculating the speed of sound with a starter pistol, a stop watch and a walkie talkie. I remember him teaching about nerves with pins taped to a meter stick. I remember him making a come-back can. I remember him cutting a small piece of paper so that you could walk through it. I remember him breaking a meter stick by putting a piece of newspaper on top and hitting the end, the air pressure on the paper is so great the stick snaps. I remember the challenge to blow over a little folded piece of paper. I remember the turning window optical illusion. I remember him playing music on the rim of glasses. I remember him getting an egg or ball or something into a cup by knocking a block out between them with a broom. I remember him keeping water in an inverted glass with a playing card. i remember him making a mobius strip. I remember him lighting steel wool on fire. I remember him showing how a siren works. I remember him making secret writing with lemon juice. I remember him showing how to tell if an egg is raw or hard boiled by spinning it. I remember him showing how to flip a spoon into a glass. I remember him teaching about adhesion and cohesion in water by pouring water along a string. Most of all I remember him as a man who was always willing to teach kids about science and make it fun. He explained it in a way that everyone could understand and he didn't have to resort to fancy computer graphics and the like. He used simple language, simple drawings and everyday objects. It is a lesson that sticks with me to this day and I try to teach like him every chance I get. When I was in elementary school, a teacher asked me to write about a hero of mine. I didn't have any hero's then and I don't now. I think the concept is silly. I do have role models though that I respect greatly and Don Herbert is one of the greatest of my life. I never gave it much thought but I'm sure he was one of the people responsible for making me the hands-on teacher I am today. He will be sorely missed but he his influence will never be gone.